Step 1: From the Homepage Click New Task. Step 4: Then add the Location in which the task is to be completed. If you need to disinfect the microwave in the upstairs staff kitchen. The Task is to Disinfect the Microwave, the Location is the Upstairs Staff Kitchen. 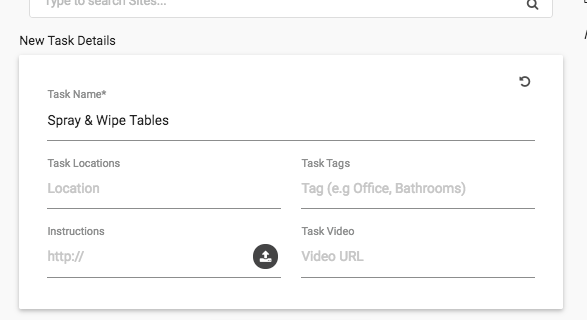 Step 5: Create a Task Tag if you may need to use a task like this again. 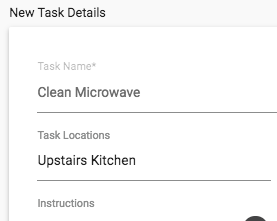 Adding a Task Tag such as "Kitchens", means that next time you're setting up a site, you can select from existing tasks tagged with the "Kitchens" Tag. Step 7: Copy a link to a You Tube Video, because while a picture tells a 1000 words, video tells 10 x that. freshOps encourages you to turn your SOP's into Videos, which are more powerful and effective in delivering the requirements of a task. If you don't have any videos, that's okay, there are plenty of Videos online now that you can use as your own. 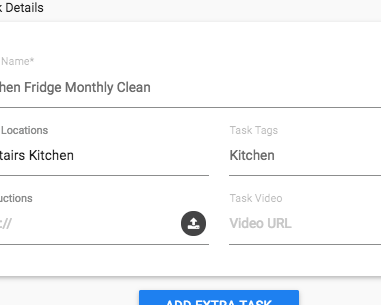 If you want to add multiple tasks that all have the same frequency such as weekly Tasks and they all require the same verification type, you can add multiples here by hitting "ADD EXTRA TASK"
Marked Tasks require your team to mark the task complete on the freshOps App. 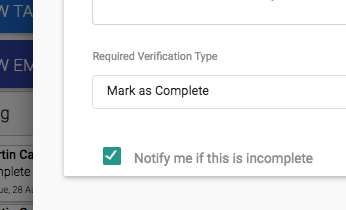 Great for those periodical tasks that need simple verification and to help remind the team when they are due. 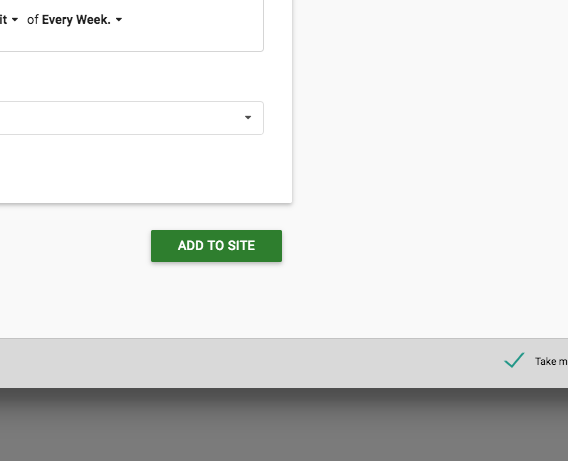 Once you've added them to the Site, they appear in the CURRENT SITE TASKS list, where you can reorder them, delete them if they are incorrect. However, if you're happy with the task list, hit CREATE, which will create the task List for the specific site. Option 1: Discard, does just that………. It discards all the details you have entered and returns you back to the Dashboard. 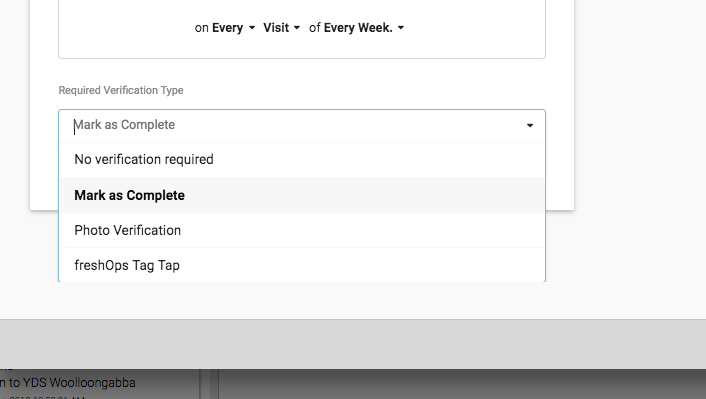 Option 2: Create with the “Take Me To allocate an employee” option marked will create your Task List and take you to the Employee Allocation screen. Option 3: Unmark the "Take Me To allocate an employee "option and just create the tasks and return to the dashboard. Task Frequency is really important to think about, not only the frequency in the field, but how you handle frequency in freshOps. 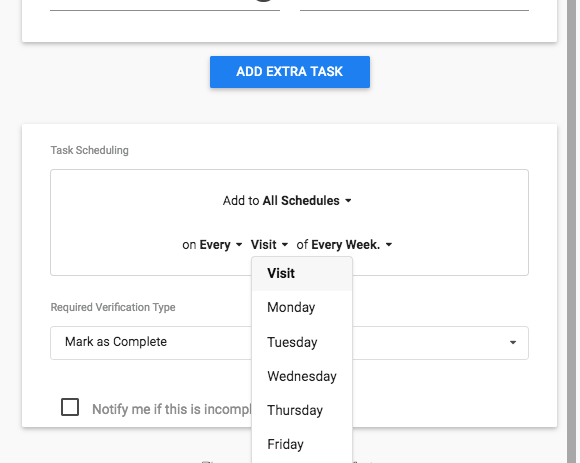 While in general it's pretty straight forward, it's important to highlight the difference in allocating a Task to a specific"Day of the Week" or to a specific "Visit Schedule". If your Site is serviced daily (7 days per week) or every weekday (Monday - Friday) scheduling tasks to specific days of the week is a no brainer. If it needs doing on a Monday, specify so. Infrequent visits, such as twice weekly, 3 times a week, weekly, fortnightly etc can cause issues especially if your client calls and requests that the DAY in which the service is required needs to change. If ABC Engineering is serviced Monday, Wednesday & Friday, it may be obvious to schedule some tasks to be done on say Wednesday and others on Friday. However, you would be specifying a Day of the Week. Which means if the client decides now, that they want a Tuesday, Thursday & Saturday Morning Clean, and you simply EDIT the existing schedules to occur on these new days, freshOps is still going to schedule the tasks on the days of the week you previously specified. When a site is serviced infrequently (twice weekly, 3 times a week, weekly, fortnightly etc), schedule the tasks to the specific Visit Schedules. In the case below, schedule the "High Dusting" to the Pastrano Friday Clean. This means the freshOps specifically links that task, with a specific schedule, rather than a specific day. So when the Visit Schedules change days, the tasks move with them.